Several times during the “99 Virginia Football Thoughts Before Kickoff” series, we’ve used an Athlon Sports article as a jumping off point for a topic. It’s time to go back to that well for this entry. On Wednesday at AthlonSports.com, an article published that provided anonymous quotes from conference coaching staffs about their league opponents. It’s an interesting read and something that their site has done for at least three years running. You can read this year’s full article here; click here for 2016 and here for 2017. Make sure to give the AthlonSports.com site a look in general too if you’re gearing up for the season. That’s a snippet of interest for the long-term outlook. Mendenhall opened with a 2-10 debut season, but then guided the Hoos to a bowl game for the first time in six years with a 6-6 regular season record in 2017. There is a clear plan in the works for the long-term view as well with Mendenhall providing specific benchmarks for roster numbers position by position, strength and conditioning targets for each player, and recruiting profiles with support from the Engineering Department. For the 2018 season, however, I thought the other quotes captured three key challenges facing this year’s team. This anonymous quote touches on one of the ongoing storylines for Mendenhall’s attempt at rebuilding the Virginia football program as well as something that will be a key piece of the puzzle this season. Play in the trenches. It’s a significant opinion when how physical the Hoos played made a positive impression last season. On the offensive line, I think this coach’s quote missed the mark a little bit but still hit the important part. This unit actually will be more experienced in terms of games started than in recent seasons. Projected early-season starters Jake Fieler (15), Dillon Reinkensmeyer (11), R.J. Proctor (6), and Marcus Applefield (11) have combined for 43 starts in their careers. Plus, Applefield represents the only graduate transfer in the mix this season after UVA started two guys from that talent pool a year ago. In other words, this is a unit that appears to be developing. Is it still a year away from true stability and becoming a leading linchpin on offense? On the defensive line, which the quote didn’t mention specifically, it’s a different story. The Cavaliers brought in two graduate transfers that are expected to be in the rotation to avoid a critical depth chart situation. Even with those additions, however, Eli Hanback is the only player with double-digit starting experience – he’s got 24 starts under his belt. It’s unclear how that unit will perform in game action. Can they help stop the run or does UVA have to commit more players in the box? Will they help generate a pass rush or will blitzes be heavy? One last thought on this quote in particular: “This will be the true test … if they’ve bought in.” All reports around the program, both within the McCue Center and the ripple rumors around town suggest that the players are fully bought into the process with this staff. That begins with offseason strength and conditioning workouts, which have impressed the staff. Time will tell how far that carries the team this season. Two quotes in the article mention that Virginia has “some good young players” on defense with the second one noting that “those guys better make big strides quickly” when it comes to the 2018 season. The good young players line could refer to a pair of sophomores like lineman Mandy Alonso and safety Brenton Nelson, the ACC Defensive Rookie of the Year in 2017. Both of those players still have high ceilings in the program. Of course, the quote itself mentions linebacker Jordan Mack specifically, but I’m not sure why he qualifies as a young guy on defense. Mack enters his junior season with 22 starts already under his belt and a 114-tackle season to his credit from a year ago. After the first game of the season, he’ll have played in more games than he has remaining in his career. That doesn’t strike as young. If that counts, go ahead and throw fellow juniors Bryce Hall and Chris Moore into the conversation. Hall owns 20 career starts with three interceptions; he put up 47 tackles and nine pass breakups in 20 17. Moore has started six times and emerged as a key hybrid sub at linebacker-safety last season. He had 41 tackles in that role a year ago. That doesn’t even mention the fact that senior linebacker Chris Peace and senior safety Juan Thornhill figure to be the leaders of the defense this season. In other words, while the D-Line has question marks, this isn’t an inexperienced collection of players. The big strides in the quote likely apply to only one or two positions (on the defensive line and at the second outside linebacker position in particular), while the rest need to continue to build on a solid foundation that Mendenhall has installed the past two seasons. Finally, one last quote addresses one of the program’s biggest issues over the last decade and one of the biggest unknowns for this season all in one. Is Bryce Perkins ready to be a successful FBS level quarterback? Fans have discussed Perkins and his impact – for better or for worse – on the team’s chances this season. It’s clear that the coaching staff and teammates are excited about his potential, especially as a potential boost toward an option-heavy set of schemes offensively (run-pass options, read options, etc.). Plus, he’s got a strong enough arm to keep the downfield passing threats going that made UVA’s offense successful at times with Benkert. 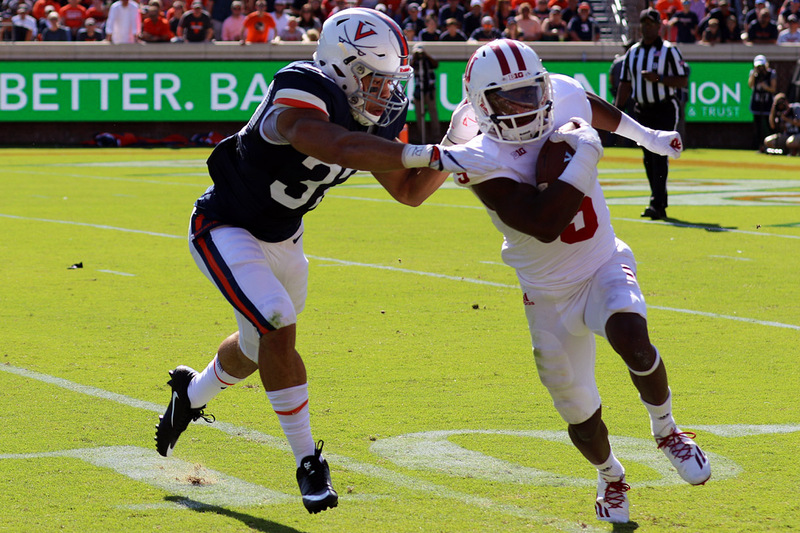 If that all comes together, along with the aforementioned development on the offensive line, then the Hoos might be able to create a more consistent attack on offense. On the other hand, if Perkins struggles to pick up the reads, especially in the passing games, defenses might be able to shut down the run and slow the whole offense by extension. Plus, there’s the injury concern category. If Perkins misses time with an injury, that likely will thrust either Lindell Stone or Brennan Armstrong into the starting role. Stone had a forgettable debut against Boston College in his only appearance last season and the offense is moving away from his pocket-passing strengths in a lot of ways. If he needs to be plugged in, does that alter the offense? Armstrong, meanwhile, enrolled in January as a true freshman. He’s a dual-threat option too, but it would trim down the playbook options while he tried to get comfortable. Or would the Hoos need to flip De’Vante Cross back to QB? Long story short: a Perkins injury sets of a lot of domino questions. UVA fans don’t have to wait much longer to see if the opposing coaches had a good read on the Hoos. Kickoff with Richmond is now less than one month away! If Jordan Mack plays in one more game, he only has fewer games left than he has played if we don’t make any bowl games or conference championship games, right? He’ll be at 26 games played (13 + 12 + 1 in 2018) with 25 to play (12 more potentially in 2018, 13 more potentially in 2019) assuming no conference championship or college football playoff games.